This newsletter summarizes the major initiatives and accomplishments of the New York State Assembly Committee on Environmental Conservation over the past year. Each citizen in New York has an interdependent relationship with the environment. We thrive and grow from the environment’s natural treasures, and simultaneously impact the earth’s health with our actions. My efforts as the Chair of the Committee on Environmental Conservation have been guided by this belief. We have worked diligently to protect our most valuable natural resources and ensure a healthy environment, and will continue to work with the Senate and Governor to build upon these accomplishments. 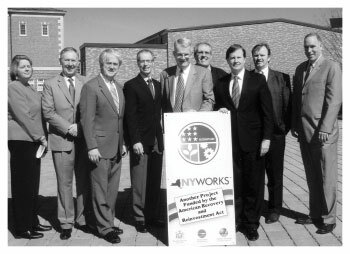 The Assembly has passed comprehensive e-waste legislation for many years. This year the Senate and the Executive followed the Assembly’s lead and agreed to legislation that is now law. The electronics industry has made technological strides, providing a range of products that were once unimaginable. DVD players, high-definition digital televisions, digital music players, laptop and personal computers and advanced video game systems have enhanced the lives of countless consumers. Unfortunately, too often when they become outmoded or pass their usefulness these technologies are discarded in the same manner as regular waste. Electronic waste (e-waste) often contains heavy metals including cadmium, lead and mercury that can pose significant environmental and health-related hazards if not disposed of properly. Under the new law retailers and manufacturers may work together to recycle electronic devices that may otherwise end up in New York’s landfills. Manufacturers’ recycling registration fees will be used to support the Environmental Protection Fund. Status: signed into law. Exposure to chemical pesticides by children has been linked to a wide range of health problems ranging from skin and digestive tract irritation to heart palpitations and neurological ailments. Even low-level, long-term exposure could be potentially fatal to a child. Seeking to reduce children’s exposure to harmful pesticides, the Assembly spearheaded successful legislation that will prohibit pesticide applications at public and private schools and daycare centers for purely aesthetic purposes. Under the law, a pesticide application at a school or daycare center can only be made after an emergency determination by the state departments of Environmental Conservation, Education, Health or a county department of health or public school board. The law will encourage school districts and daycare administrators to develop pest-management plans that reduce the use of harmful chemicals. Status: signed into law. Both houses of the New York State Legislature unanimously passed legislation to end the sale of Bisphenol A (BPA) based baby bottles, sippy cups, pacifiers and straws as of December 1st of this year. New York is the seventh state to pass legislation requiring the phase out of BPA in young children’s products. BPA is an estrogen-mimicking endocrine disrupter chemical used in the production of epoxy resins and polycarbonate plastics. It is the main ingredient in hard polycarbonate plastics. BPA has been linked to breast cancer, prostate cancer, and polycystic ovary syndrome. Its effects on children are especially worrisome. Present in pacifiers, baby bottles, sippy cups, bottle liners and straws, BPA can disrupt hormone levels or cause the early onset of puberty. Studies have shown BPA to be present in the blood streams of the vast majority of the population. Ninety-three percent of Americans have measurable levels of BPA in their bodies, with children having higher levels than adults, and infants the highest. The law prohibits the manufacture, distribution, sale or offer for sale of any child care product containing BPA intended for use by a child three years of age or under. The age of three reflects the type of products that are used by infants and very young children. This law will significantly reduce the risk posed to children by these chemicals. By prohibiting BPA in children’s products, New York joins with other pioneers in protecting children from toxic chemicals. Six other states have enacted laws to limit BPA in children’s products, as have four counties in New York. Canada has announced that it is proposing a ban on polycarbonate baby bottles and strict limits on BPA in infant formula cans. Status: signed into law. Poor air quality is a serious concern throughout the state. High concentrations of particulate matter in the air are known to increase the incidence of asthma, cancer, heart disease, and lung disease. Sulfur emitted by the burning of diesel fuel is a significant contributor to air pollution and poses a serious threat to children, costing the state hundreds of millions of dollars in health expenses annually. The new law will sharply reduce the amount of sulfur allowed in home heating oil from over 2,000 parts per million to 15 parts per million after July 1, 2012. The law will align the state’s home heating oil standards to the federal standards for diesel used in trucks and farm and construction equipment. The new law is expected to save New Yorkers significant amounts of money. Because the fuel will be much cleaner, homeowners will no longer need to service their home heating equipment annually. By extending the time between cleanings, they can save hundreds of dollars annually. Being cleaner, low-sulfur heating oil will enable New Yorkers to purchase cutting edge high efficiency heating systems, which can reduce fuel costs by a third or more. Not only does this create jobs at the manufacturing, retail and installation levels, the equipment pays for itself quickly, adding permanent value to the home and strong return on investment. Switching to low-sulfur home heating oil confers other financial advantages. As a nearly identical product to on-road diesel fuel, home heating oil will reduce costs at the distribution level by allowing distributors to supply the vehicle and residential markets simultaneously. This is expected to significantly improve efficiency at the point of supply. Passing both houses, and going on to be signed by the Governor, this new law will dramatically reduce New York’s sulfur emissions, lower costs for homeowners and suppliers, and spur job growth. Status: signed into law. Reducing the Phosphorus in New York’s Waterways (Chapter 205 of the Laws of 2010). Although algae is a natural feature in many bodies of water, an abundance of the green and yellow blooms can spell trouble for fish and wildlife, as it leaches much-needed oxygen from the water. It can also threaten the quality of drinking water. High levels of phosphorus – a chemical used in many household cleansers and fertilizer products – has a direct link to the growth of algae and weeds. In order to protect New York’s waterways from further degradation, the state enacted legislation to prohibit the sale and distribution of dishwashing detergents and lawn fertilizers containing certain amounts of phosphorous, and prohibit the application of phosphorus fertilizer between December and April, when it is more likely to pollute the waters of the state. Reducing the phosphorous in our waterways will save taxpayers money. Dishwasher detergents may contain up to 9 percent phosphorus and can account for up to 34 percent of the total phosphorus in municipal wastewater. Lawn fertilizer contains up to 3 percent phosphorus and can account for up to 50 percent of the soluble phosphorus in storm water runoff. Instead of removing phosphorus at wastewater treatment plants, which can cost up to $20 per pound, or removing phosphorus from storm water, which can cost between $25 and $600 per pound, the new legislation will reduce the phosphorus at its source by regulating its use in home products. Status: signed into law. Assemblyman Bob Sweeney provided a special legislative grant to the New York State Office of Parks, Recreation and Historic Preservation to fight invasive species without the use of chemical pesticides or herbicides in the Belmont Lake State Park. Belmont Lake has substantial growth of an invasive aquatic weed, fanwort (Cabomba Caroliniana). The lake is a popular recreation area with a perimeter trail for hiking, shoreline fishing, and paddle boat rentals. The heavy infestation of non-native aquatic plants had impaired all of these uses. State Park staff worked to control fanwort in the lake and completed an assessment of the lake’s bathymetry and sediments. This information will be used in developing a comprehensive lake management plan. Recreation at Belmont Lake has been severely impacted by aquatic weeds and sedimentation. Benthic Barriers. Parks purchased and installed benthic barriers in the boat rental area. This has resulted in significant control of invasive plants. Research. Funding was also used to complete a comprehensive bathymetric survey (measuring lake depths and mapping the locations of sediments) and a sediment survey (analyzing priority pollutants and sand grain characteristics). Stream gauges were installed in the Carlls River inlets and outlet of Belmont Lake. Data sheets have been generated to provide weekly records critical to the preparation of a comprehensive management plan. Research plots were also studied. Hand-pull Project. An invasive weed hand-pulling project was undertaken that removed 2.44 tons of plant material. State Parks will use the remaining funds to manage fanwort growth through the use of several control methods, including mechanical harvesting. This funding has been instrumental for enhancing lake habitat and recreational opportunities at Belmont Lake State Park. It also will allow state parks to gather the information necessary for developing a comprehensive approach to lake management that will improve the park for years to come and serve as a model of lake restoration efforts. New York’s zoos, botanical gardens and aquariums (ZBGA), were threatened when the Governor proposed a 50 percent cut in funds for these programs. Living museums generate millions of dollars each year for the state in tourism and economic development. Businesses profit from the sale of goods and services to zoos, botanical gardens and aquariums. Money spent supporting the 80 living museums across New York State strengthens our economy through jobs and support for industries that depend on their existence. The facilities supported by this program run from Long Island to Buffalo. They include world-renowned locations and organizations such as the Bronx Zoo and Audubon New York to smaller local nature museums. The Assembly was successful in fully restoring funding for the zoos, botanical gardens and aquariums. The Lindenhurst Memorial Library was awarded a New York State Green Innovations grant of $200,000 for the completion of its new parking lot across from the library building. The New York State Green Innovation Grant Program, funded by federal stimulus funds, supports up to 90% of eligible project costs for the installation of innovative, cost-cutting solutions for water conservation, energy-efficiency technologies for drinking water, and clean water infrastructure. The Lindenhurst project installed permeable pavers to control flooding and water runoff; installed solar powered LED lights that need no connection to the power grid; used recycled materials for the fencing and carstops; and creates bio-swales with drought-resistant plants around the lot to prevent water run-off. Assemblyman Sweeney is pictured explaining the need to prohibit the use of pesticides on school playgrounds. Sweeney said, “Children are more sensitive to and are at an increased risk from pesticide exposure. Environmental links have been established for many illnesses and research is continuing to provide new evidence each day. Limiting children’s exposure to pesticides is a practical and reasonable precautionary measure.” This legislation is now law. 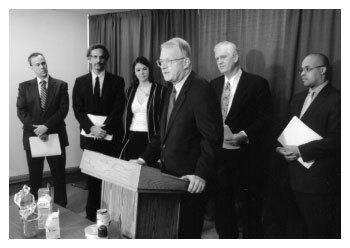 Pictured left to right behind Assemblyman Sweeney are: Stephen Boese, Learning Disabilities Association of New York; Russ Haven, New York Public Interest Research Group; Bobbi Chase Wilding, Clean New York; Assemblyman Steven Englebright, prime sponsor of the legislation; and Senator Antoine Thompson, the Senate sponsor of the legislation. Assemblyman Bob Sweeney visited the Sea Explorers Marine Camp run by Cornell Cooperative Extension at the Sport Fishing Education Center located at Cedar Beach Marina. The camp runs in one-week sessions throughout the summer and provides kids with an interactive, hands-on opportunity to explore and learn about Long Island’s marine habitats. 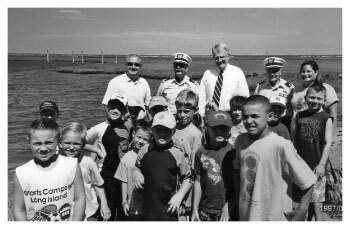 Assemblyman Sweeney is pictured with some of the campers, staff, and members of the U.S. Coast Guard Auxiliary, which makes presentations at the camp. Cornell Cooperative Extension runs programs year-round at the Sport Fishing Education Center. For information, call 631-587-2932 or check out www.ccesuffolk.org.